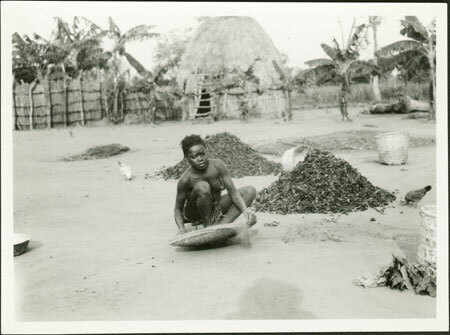 A pile of eleusine coracana (a type of millet crop that also forms the basis of beer-brewing) in a homestead being winnowed by a young woman (identified as Namarusu). This crop was once the most important base for porridge and beer, but has been displaced to some extent by manioc, a highly drought and pest resistant tuber, which is however somewhat less nutritious than flour produced from grain such as eleusine. Beyond is the large old-style granary (soro) of the homestead. Morton, Chris. "Zande eleusine crop" Southern Sudan Project (in development). 03 Jan. 2006. Pitt Rivers Museum. <http://southernsudan.prm.ox.ac.uk/details/1998.341.111.2/>.